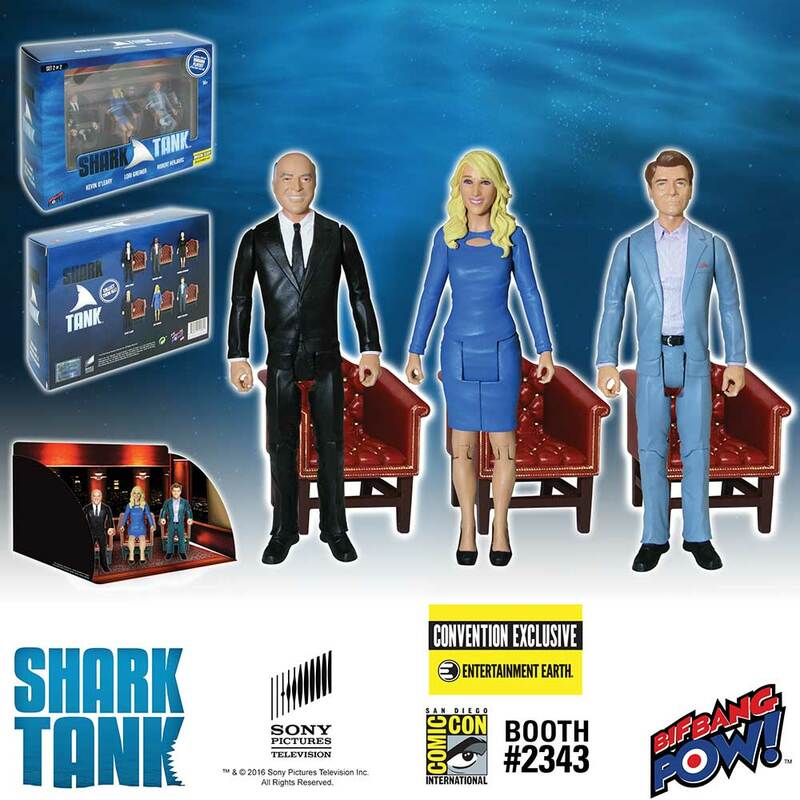 Bif Bang Pow!, producer of first-rate collectible merchandise, is excited to announce its new deal with Sony Pictures Television to create a unique line of consumer products celebrating the popular television series Shark Tank. "As an entrepreneur myself celebrating a 20th anniversary in the consumer products business, I have great respect for the Sharks on the Shark Tank panel as well as anyone who stands before them to pitch their ideas," commented Jason Labowitz, President and Co-Founder of Bif Bang Pow!. "While Bif Bang Pow! produces plenty of collectibles that celebrate fictional superheroes, these 'Sharks' are real life superheroes - saving the day by investing in businesses that create jobs, which ultimately improves lives for thousands of families." This new line-up of collectibles will offer exciting, never-before-made merchandise inspired by the show - providing something for the aspiring entrepreneur and fan alike. 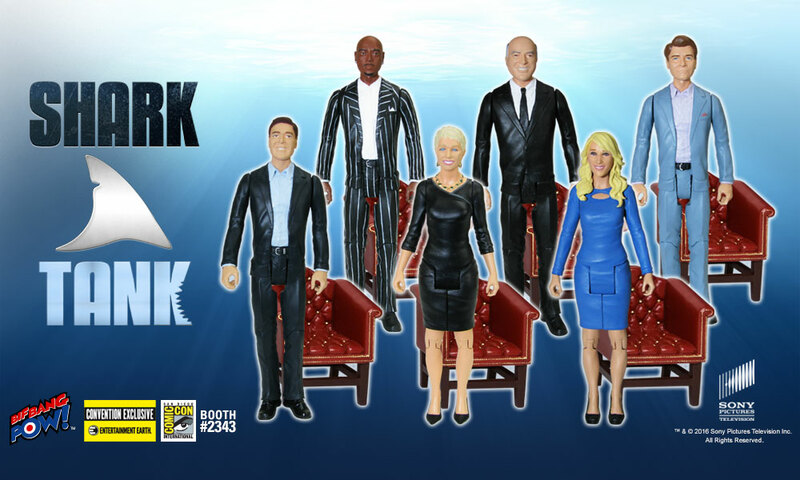 The first Shark Tank collectibles – exclusive 3 3/4-inch action figures of the Sharks - will be offered to fans attending San Diego Comic-Con this July. Available in two separate limited edition sets, each Shark action figure was digitally sculpted and has 7 points of articulation. Mark Cuban, Daymond John, and Barbara Corcoran are in set one; Kevin O’Leary, Lori Greiner, and Robert Herjavec are in set two. 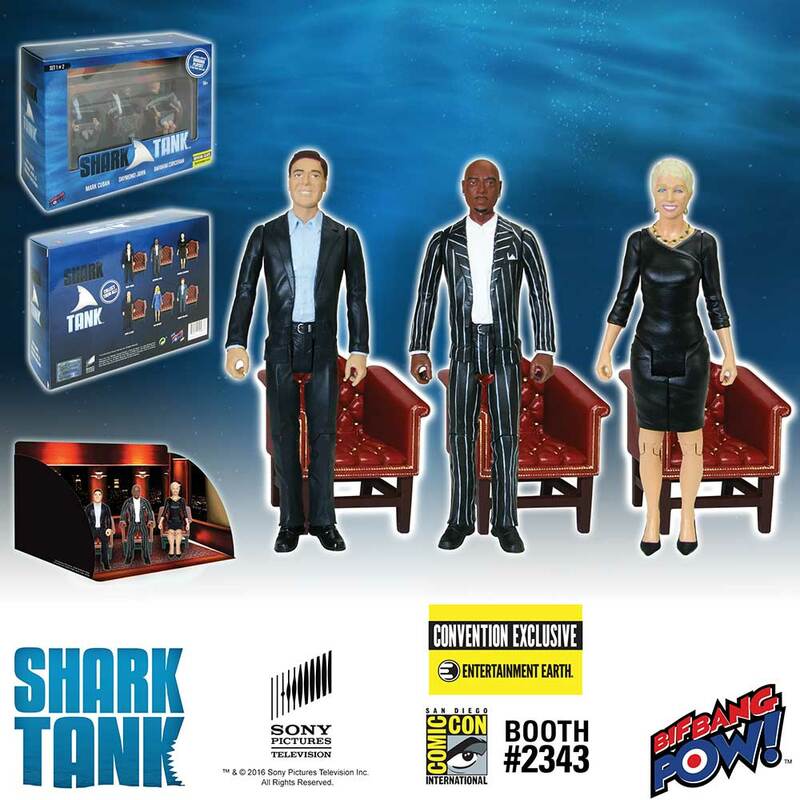 Additionally, each set comes with chair accessories and a foldout diorama of the actual Shark Tank television studio set. Each collectible is individually numbered with a holographic sticker, highlighting the limited production run of only 1800 units. 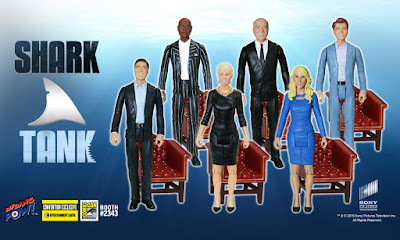 "Following last year’s hugely successful convention exclusive set featuring two very popular real life female comedians, revealing our first Shark Tank items as convention exclusives at San Diego Comic-Con is very exciting for us," Labowitz continued, "And, in true Shark fashion, the Sharks (after seeing the figures) inquired about what their royalty and cut were." In development now, the diverse range of products will also include drinkware, stationary products, car accessories, and a question-and-answer ball that features well-known Shark catchphrases. Shark Tank merchandise from Bif Bang Pow! will be available via Entertainment Earth and other fine retailers. For updates on product releases and pre-orders, visit entertainmentearth.com. Bif Bang Pow!™ designs and develops first-rate merchandise from well-known licenses such as Shark Tank, Marvel, The Big Lebowski™, DC Comics™, KISS®, Flash Gordon™, Penny Dreadful™, Mike Tyson Mysteries™, The Big Bang Theory™, Star Trek™, and The Twilight Zone™. Co-founders Jason Labowitz and Jason Lenzi are the ultimate fans of cultish pop culture, so when they created this company in 2005, they took the fan's perspective. Their idea was to bring items to the marketplace that they themselves would want to own. Cultivated from TV, movies, books, comics, music, and more, the Bif Bang Pow! mission is to provide high-quality action figures, toys, and collectibles to the massive cult audience (and any kid at heart) that wishes these toys were already in their collection.